Looking for the easy way to increase the horsepower of your big twin motorcycle? We can improve your horsepower and torque. Twin Cam engines with fuel injection have become a favorite performance platform over the past couple of years. MPH Ohio offers you information for a variety of upgrade paths. High maintenance usually requiring decarboning the cylinder heads and pistons on a frequent basis. And these are just a portion of the issues you have to face with these “monster” engines. Unfortunately, few riders think about this until their dream engine turns into a nightmare 9 months down the road. An engine that can be used in heavy FLH’s and Road Kings, as well as in the lighter Dyna’s and Softail’s. An engine that will run on pump fuel without having to worry about detonation. An engine that requires a minimum of parts and doesn’t break the bank. An engine that has a horsepower figure high enough to get some respect when bench racing. An engine that would smoke the other V-twins between stoplights or at the drag strip. An engine that would be easy to ride and live with when riding in town. An engine that woud have near stock reliabililty. out of context. A good street engine has a broad torque curve that gets a bike moving quickly and keeps the acceleration going. A good average power number is more important than the maximum number. If you went to most shops and gave them this list of “wants” for your updated engine, they would probably tell you that it just isn’t possible to build this engine. In most circumstances, I’d have to agree with these shops. Then I saw something that completely changed my opinion on what could be built. in much lower power than possible with the higher compression. I had never been a big proponent of high compression engines for heavy bikes, especially when I knew that once compression ratio’s exceeded 9.5:1 the extra power gained for every point of compression gained was very small. But a high percentage of the HD performance industry insisted on going with these high compression engines in heavy, air cooled bikes. The engineering and physics involved in this never made sense to me. MPH has been building world class engines for all type of bikes for many years. Here at MPH we got tired of riders asking for big power engines in heavy bikes, then having to “back off the tuning” to handle the way most riders lug their engines around town. While sitting at the shop one day and discussing strong street engines I mentioned a very conservative 105/106+ engine I had recently put together. Knowing that MPH always puts together strong engines, I expected to see a nice power curve in the 2800-5500 RPM range. I was completely blown away when they showed me the dyno sheet on this table-top smooth power curve at 106ft.lb. starting at 2400 RPMs to over 5000 RPM. This same engine made over 105HP, all from a TC95 with a 9.5:1 compression ratio. twist the throttle around. With its lower compression, it isn’t going to have much of a detonation issue. It is actually going to make a bike run much faster than the horsepower numbers would have you believe. In short, very close to an ideal street engine for any TC powered bike. Here at MPH we have several specific components that we know work better together than others and each motor we build is custom suited for its owner. The guidelines above are just that a guide. Now on certain builds I would stay away from porting heads. Lots of time more than not the head are left stock to keep the power delivery lower in the rpm ranges. Free flowing heads tend to mover the usable power up in the rpm ranges. This is just one of many examples why it is imperative to sit down and talk to me one on one so I can spec out the best performing package for your budget. While I am showing some alternative engine components, this is for convenience only. The only way to ensure you get the same power results would be to have MPH actually build the bike. You should be able to get similar results by order all major components from us. If you want to use other components other than those listed, you can expect different results. If you want to build an engine like this, you can contact Doug at MPH 330-922-8000. I think you will be very happy with an engine like this. As a note to those riders who want to save some money, this engine combination can be done without going to the 95CID big bore kit. It is estimated that the TC88 version of this engine would make 2-3HP and 3-4 ft.lb. less power, but with the same broad, flat power curve. For the guy with the bigger stock motors 103″ for example we offer similar builds as well. Final hp and torque will increase as expected but overall performance will be similar in rpm range and pull for a wide torque ranges of performance. Confused about your fuel injection system? We explain how your Harley-Davidson motorcycle fuel injection system works with our EFI 101. In its simplest terms, an electronic fuel injection (EFI) system is a computer controlled fuel delivery system. This electronic control unit (ECU) reads various sensors located on the vehicle and makes the determination of how much fuel to allow the engine to have based on this information. The computer will open and close the injectors allowing gasoline into the engine based on the sensor inputs and the fuel map programmed into the computer. The various sensors (RPM, engine temperature, air temperature, throttle position, manifold pressure, crankshaft position) provide information on operating conditions and load on the engine. Figure 1 is a detailed drawing of a typical fuel injection system and the sensors that might be in place. The EFI Components table provides a detailed description of each of the major components. We will limit our discussion to the types of fuel injection systems that are likely to be encountered on motorcycles. One of the major differences between fuel injection systems is how the sense the amount of load that is placed on the engine. The load can be sensed by how far the rider has twisted the throttle and MAP (manifold absolute pressure). EFI systems that sense engine load by the use of the throttle or TPS (throttle position sensor) are referred to as an Alpha-N system. EFI systems that sense engine load by the use of a MAP sensor are referred to as a Speed-Density system. Harley-Davidson has used both types of EFI systems on its vehicles. While many of the sensors can be the same in both types of EFI systems, there is a significant difference in the way that each system determines what the load on the engine actually is. The Magneti-Marelli system used on EVO and Twin Cam FLH’s until 2001 and Buell XL engines is an Alpha-N EFI system. On these bikes, load sensing is determined by the throttle position. The newer Delphi EFI system used on current Twin Cam engines is a Speed Density system. Speed Density EFI systems determine the engine load based on the intake manifold vacuum. 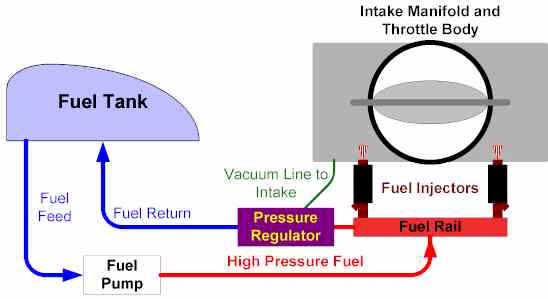 The fuel system diagram provides a simplified view on how fuel flows within an EFI system. The fuel tank supplies gasoline to the fuel pump. The fuel pump can be located in the fuel tank or external to the tank. The fuel pump provides a high pressure feed to the fuel rail that contains the fuel injectors. On the fuel rail there is a pressure regulator that limits the fuel pressure to 39-45 PSI and maintains a constant pressure. The pressure regulator has a vacuum line that connects it to the intake manifold. Any excess fuel leaves the pressure regulator and is returned to the fuel tank. Why is EFI better than a carburetor? Choosing a carburetor and tuning it is always a series of compromises. A carburetor is a demand device dependent upon the velocity of the air entering the venturi to create the air/fuel mixture that feeds the engine. A carburetor maintains a series of fuel circuits to help maintain the best possible fuel mixture. The idle circuit, intermediate and main jetting circuits are used to tune the mixture across the operating RPM range of the engine. These different fuel circuits can interact with each other creating rich and lean spots in the fuel curve. Some riders will go as far as to add one or more additional fuel circuits (Thunderjet) in an effort to improve the fuel curve. The interactions of these additional circuits further complicate the tuning efforts. A change in jetting to one fuel circuit can impact the required jetting in another circuit. Sound complicated? It certainly can be. Lets simplify matters and assume a carburetor with nothing more than an idle circuit and main circuit. To optimize low RPM performance a small diameter carburetor provides the best performance, but at high RPMs a large volume of air is required to feed the engine. This requires a much larger diameter carburetor. The ability of a carburetor to provide a good air/fuel mixture is very dependent upon the velocity of the air going through the carburetor. This “signal” must be present to maintain good throttle response. 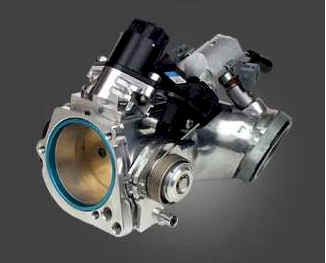 If the diameter of the carburetor is too large for the engine, low RPM performance can be very poor. Most HD mechanics and riders are aware that the “large carburetor” syndrome creates a poor running engine. This situation does not occur with an EFI engine. With an electronic fuel injection system, the required fuel amount for each RPM and engine load condition is located in the fuel map located in the ECU(or addition on a powercommannder). Once this primary fuel amount is known, then the ECU further adjusts the fuel mixture for the engine and air intake temperatures. In many cases, the mixture will even be adjusted for the barometric pressure and altitude. Based on the various sensor inputs to EFI ECU, there is only one fuel value that is generated. The correct fuel amount is fed into the engine at all times. Because airflow does not have to pass through a venturi to provide an air/fuel mixture, the throttle plate diameter can be quite large. This engine is allowed to draw all the air it wants. Since more air equates to higher horsepower potential, all the EFI has to do is provide the correct amount of fuel for the increase in airflow. In conclusion this is why any modification needs to have the most critical part of any build performed, DYNO TUNING. This holds true to every time you ask “Do you think my bike needs tuned?” By now you should be able to answer that. “But I only put on slip-ons!” Again the answer is and will always be “YES!” I would take a perfectly tuned stock bike over any monster poorly tuned bike anyday until you bring that monster into MPH and let us make it breath fire than all bets are off.